The world renowned mathematician, Dr. J.R.R "Bob" Dobbs, has collected rocks for years, and has built up quite a substantial collection, which he keeps scattered throughout his backyard. Unfortunately, after an interview with the local newspaper, thieves have been trying to steal his precious stones, and so Dr. Dobbs has called the Convex Fence Company to build a fence around them for him. His instructions to the Convex Fence Company were very precise. Being very proud of his collection, he's instructed that the Convex Fence Company make sure that no matter where he's standing in his yard, the fence doesn't block the view. 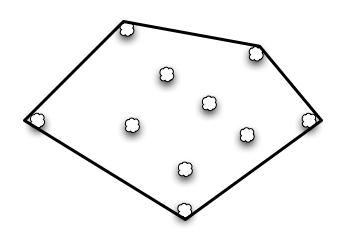 Below is an example of a possible fence. Given that fence costs m dollars per meter, what is the minimum that such a setup will cost? Note that sections of the fence can only be built in a straight line, and assume that rocks take up only a point. The output file OUT4.txt will contain 5 lines, a formated string per line -- the cost to fence Mr. Dobbs' rocks. Note: the formated string for the output is in the form $abc.00.